"Usually praising a movie about its new technology makes about as much sense as praising a movie for its old technology. Within a year or two, all technology becomes old technology, and the reasons that a movie is good or bad have a lot to do with how the technology is used and little to do with the technology itself. But this 'motion-capture' process, first seen in 'The Polar Express,' constitutes a creative breakthrough as well as a technological one. "Animated films always had the advantage of being able to go anywhere and show anything, to defy the laws of physics and follow the imagination as far as it could go. But they never had the ability to show the human face. There was never any point to a close-up in an animated film — there was never really anything to see. But with the motion-capture process, real actors give their performances with computer sensors attached to their face and body, and that recorded information becomes the template for the computer animation. If an actor is bug-eyed, the character will look bug-eyed. Moreover, if the actor is thinking or is full of doubt, the technology will be able to render subtle qualities of pensiveness or doubt in the animation." A.O. Scott, The New York Times: "'Monster House' is unpretentious, smartly written (by Dan Harmon, Rob Schrab and Pamela Pettler) and a lot of fun." 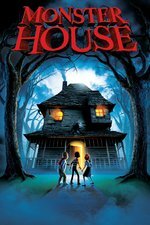 Not everyone was a fan - Ann Hornaday, Washington Post: "...'Monster House' is a grisly, often cynical piece of work whose joyless, aggressive spirit is made even less appealing by its soulless visual style." Steven Spielberg and Robert Zemeckis are among the producers. "This is why nobody will sit next to us at lunch." This was one of those movies I kind of wrote off when it first came out, then later watched it on cable and thought, "Whoa, this is good!" This is important, because it takes a good film to rise above Zemeckis' preference for motion capture for animation. It's a burden to finish The Polar Express and Beowulf definitely suffers. For some reason, it didn't happen in this film. It had a good balance of being a smart movie that related the experience of kids, something more akin to Goonies than to a lot of other animated fare at the time. The characters don't have that "dead eye" mo-cap look. Steve Buscemi's old man seems particularly vivid and alive. Buscemi "over-acted" on purpose, so his character's emotions come through and he looks like a character who was actually animated instead of a Zemeckis-esque mo-cap zombie. Watching the making-of stuff, it became pretty obvious why Zemeckis and other filmmakers were so enamored with the technology. The actors could act out a scene, and once they got a good take the director could basically zoom around the virtual set and capture the action from any angle he wanted, with the option to change the lighting and all kinds of other stuff. The level of control was amazing and unprecedented. But it came at the cost of characters who looked undead. The fad seems to have burned out, and I think this is the only one of the mo-cap movies from that era that still holds up. Partly that's because the characters just look better than they did in the other mo-cap movies, but this is also just a really fun movie with characters you care about. Here's a super fun clip for fans of the film: the filmmakers work out the big action climax scene with cardboard props and action figures. It's a nice story, but I sure disagree with Harmon's take on the film. I'm curious about what happened inside the house, in his draft. In the finished film, it seemed pretty clear that the old man's wife had been a very sad, wounded woman, she'd died in the house and her ghost had possessed the place. There's nothing really confusing there. The kids are rewarded for their bravery, in that they help the ghost move on, they help the old guy accept his loss, they rid the neighborhood of the monster house, they make a new friend out of the old man, they (inadvertently) rescue the people who had been eaten by the house and everybody gets their old toys and stuff back. It's a happy ending for everybody!